In the late 1990s, after frequent visits to a holiday house at Sanctuary Point on the South Coast of New South Wales, Aspden became inspired by the patterns and colours of tree bark. 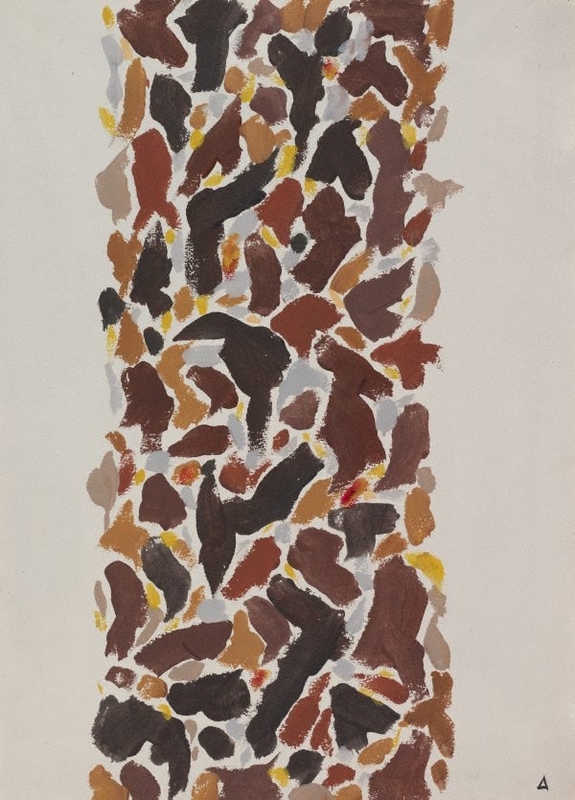 From this stimulus he created paintings with strongly allusive shapes and colours, including these ‘totem’ watercolours, so titled as a play on the connection he made to the Pukamani poles and other Indigenous objects he saw daily in his wife’s adjacent studio. Aspden also explored the calligraphic possibilities of paint and ink wash in a sequence of delicate paintings on paper evoking the distinctive birds and landscape of the South Coast. Signed and dated top c. verso, black fibre-tipped pen "Aspden '98". Signed l.r. corner, black watercolour "Δ [artist's monogram]".